Cut the crap and go straight to the point. For now, steel watch bands are divided into four types according to the materials, and they’re tungsten steel watch band, 316 L stainless steel watch band, 904 L stainless steel watch band and ordinary stainless steel watch band. Tungsten steel is another high-tech material loved by the public after the space ceramic. The material, which was applied to the space shuttles, has moved into civil use. It has the following good performance: high hardness, abrasion resistance, high strength, good toughness, heat resistance and corrosion resistance. It stays stable at 500 degrees centigrade, and it still has high hardness at 1000 degrees centigrade, close to the natural diamond’s. It has mirror-like surface which never fades and bears the mechanical shock. Tungsten steel presents silver color, and it can be plated to form gold or black so that wristwatches in tungsten steel look chic and distinctive. At present, tungsten steel watch band is the best choice of the four types. 316 L stainless steel and 904 L stainless steel belong to the austenitic stainless steel. 904 L stainless steel contains nickel, chromium and cuprum, but 316 L stainless steel doesn’t have these elements. 904 L steel is 3 times as expensive as 316 L steel, more resistant to abrasion and corrosion. Austenitic stainless steel contains more than 18 percent chromium, approx 8 percent nickel and a small amount of molybdenum, titanium and nitrogen. Nickel and chromium make the steel be austenitic state. It has the following good comprehensive performance: good plasticity, high toughness, weldability, corrosion resistance and non-magnetism or weaker magnetism, even better corrosion resistance in both oxidizing and reducing medium. 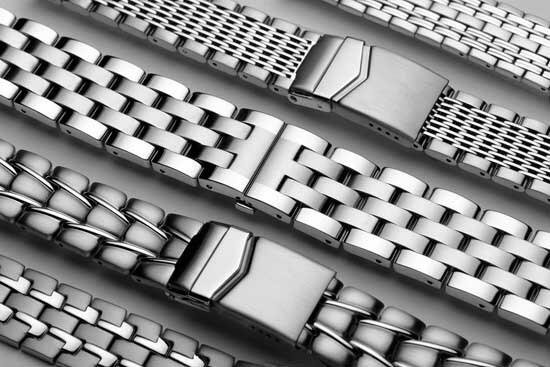 As the host material of watches and accessories making, austenitic stainless steel is under the solution treatment. Heat the steel up to 1050-1150 degrees centigrade first, then austenitic steel is finished by water-cooling. 316 L steel, the derived model of 18-8 # austenitic stainless steel, contains 2-3 percent molybdenum. With polished external appearance and good texture, 316 L stainless steel watch band doesn’t make any bad impact on the human skin generally. Almost all Swiss watch brands use the material to make watch cases, crowns and bracelets. 904 L Stainless Steel is a low carbon, high alloy austenitic stainless steel. Its high percent chromium and nickel content make it resistant to corrosion and heat. It has applications in piping systems, pollution control equipment, heat exchanges, and bleaching systems. In 1985 Rolex became the first wristwatch manufacturer to utilize 904 L grade steel in its watches. Fine steel and ordinary steel are steel, but they contain different chemical elements. Ordinary stainless steel has less excellent comprehensive performance than the three models above. Due to good luster and low cost, many watch manufacturers (Well-known Swiss watch brands aren’t included.) choose it to make watch cases and bracelets.